When it comes to decorating for Halloween I’m definitely all about a simpler and modern look. 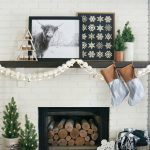 Mixing everyday home decor with festive Halloween inspired DIY decor items and ready-made decor is my favorite way to decorate. 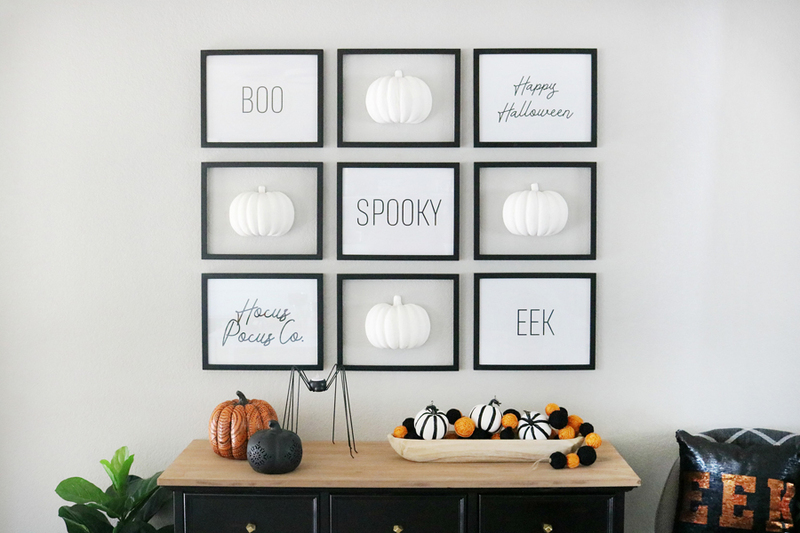 I’m excited to share my Black & White Simple Halloween Pumpkin Gallery Wall and Entryway with you today. I was going to skip the Halloween decor this year and try just decorating for fall instead, you guys…I couldn’t do it. 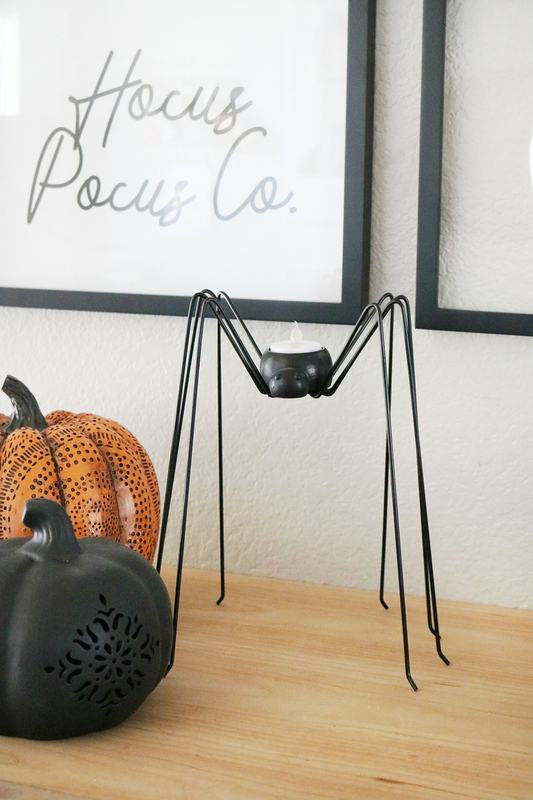 I kept seeing so many cute Halloween decor items and ideas that I had to just add a little something to our entryway. 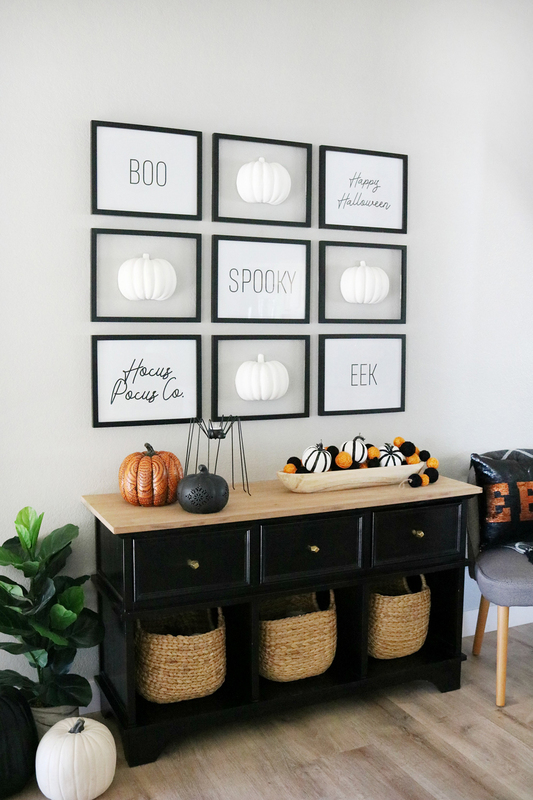 I’m so glad I did because I really love how this Halloween Gallery Wall turned out. 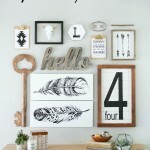 When it came to decorating my entryway I started with my wall decor. I’ve wanted to have a simple and clean gallery wall with black frames for a while now, so I decided to do it and just switch it up for Halloween. The rest of the year it will house cute art prints. 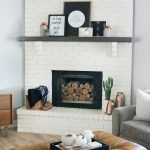 I created the DIY Faux Plaster Pumpkins for my Halloween Gallery Wall with just a few quick supplies from my local Joann Fabric and Craft Stores. Let me show you how easy they were to make. I found these foam pumpkins in the holiday decor section, I grabbed two pumpkins since I was cutting them in half to create 4 pumpkins for my gallery wall. First, remove the foam stem, it’s just glued in with a toothpick so it should come right out. I then used my FloraCraft Foam Knife to cut the entire pumpkin in half. Do the same with the foam stem you will put them back on when you are done. To give my pumpkins a faux plaster look I used FloraCrafts Smooth Finish. 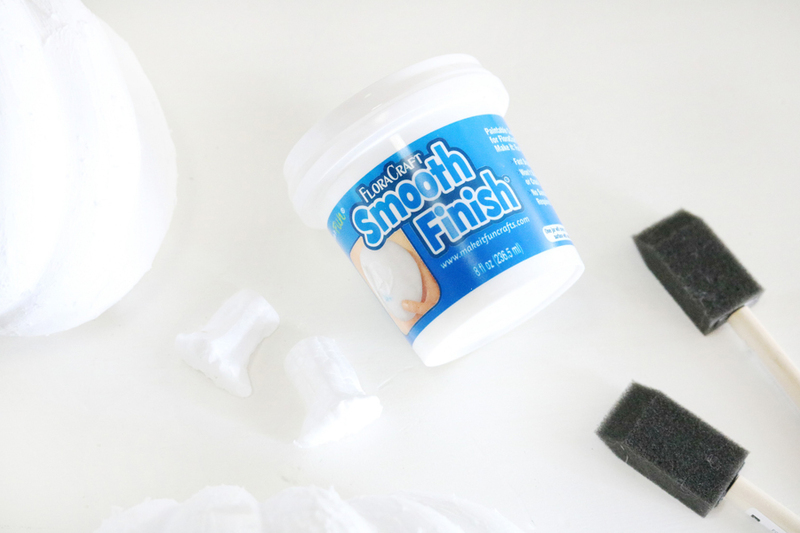 It basically takes any styrofoam item and creates a smooth texture over the whole surface and makes it easier to paint. I just use my fingers to apply a thin coat of smooth finish over the entire front surface of the foam pumpkin. It doesn’t need to be perfect since you’ll sand it out at the end. Let the first layer of smooth finish dry until it’s dry to the touch. Apply a second layer of smooth finish and repeat the drying time. If you feel it needs a third layer you can go ahead and do that. I only did two. 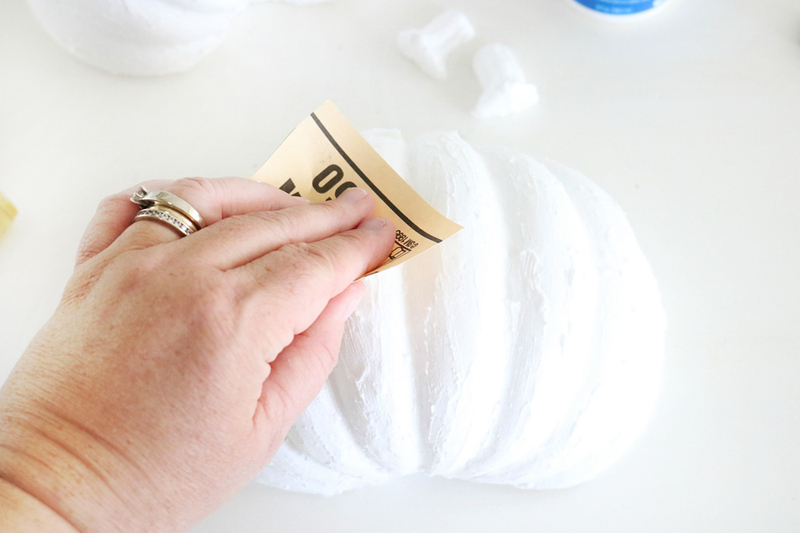 Once the foam pumpkin is completely dry you can use a fine grit sandpaper to gently smooth out the pumpkins finish. It doesn’t have to be perfectly smooth, I like to leave just a little texture. 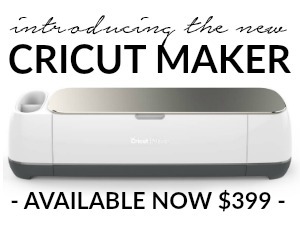 Note: You’ll want to sand this outside, it will create a pretty decent size mess. 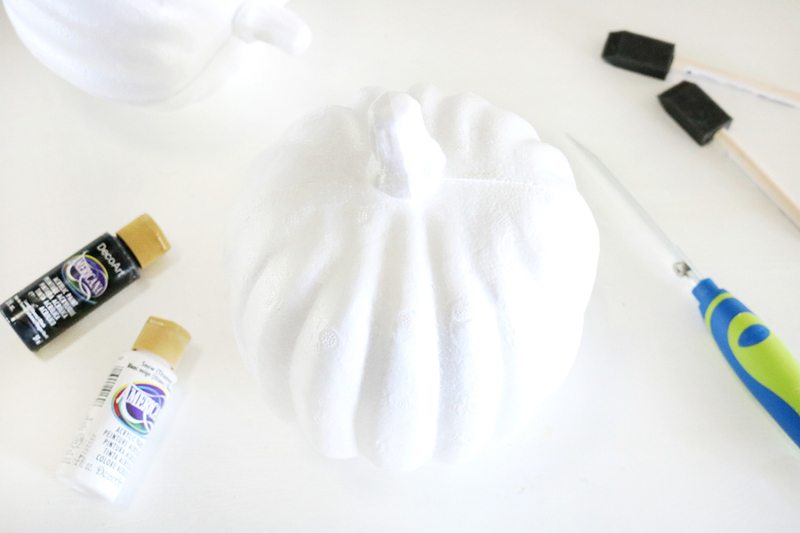 When done you can just paint your pumpkin with two coats of white acrylic craft paint and a foam brush. Don’t forget to let the first coat of paint dry before applying the second coat. Paint those foam stems too! 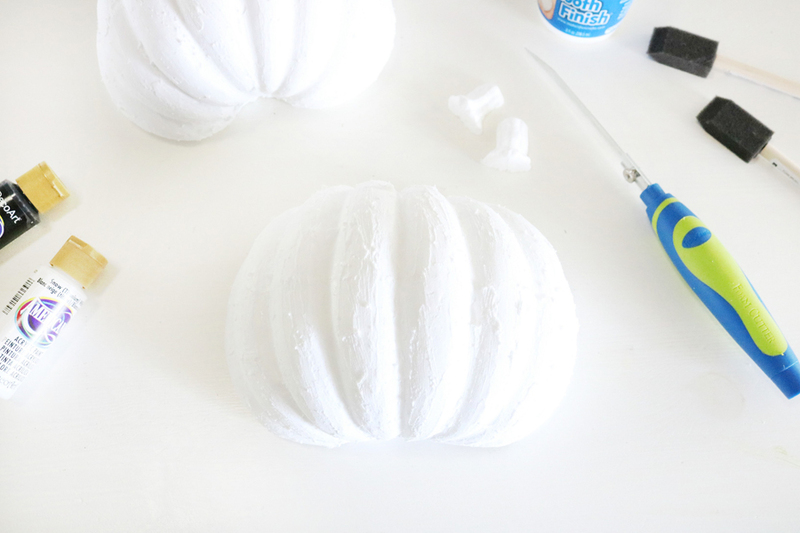 When the DIY Faux Plaster Pumpkins are dry and ready you can use a toothpick to adhere the stems back into the tops of the pumpkin halves. 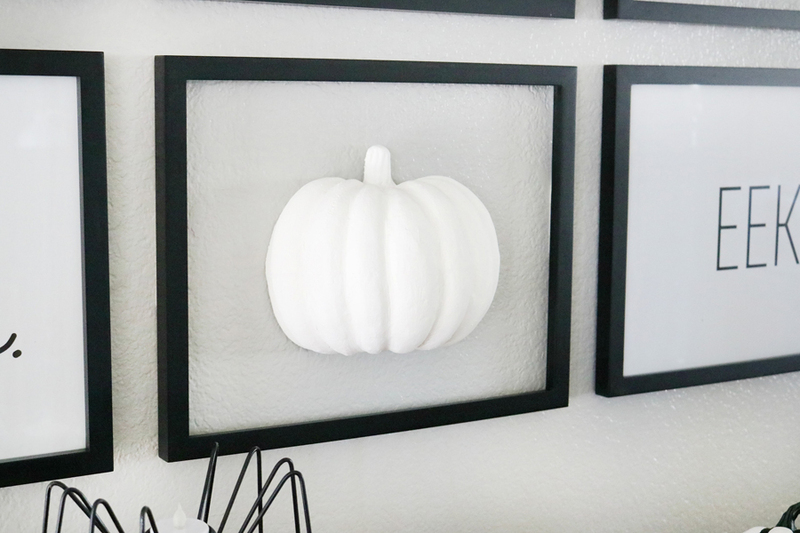 I attached my pumpkins to the wall using double sided tape, but you can use a small nail to hang it on or command strips. 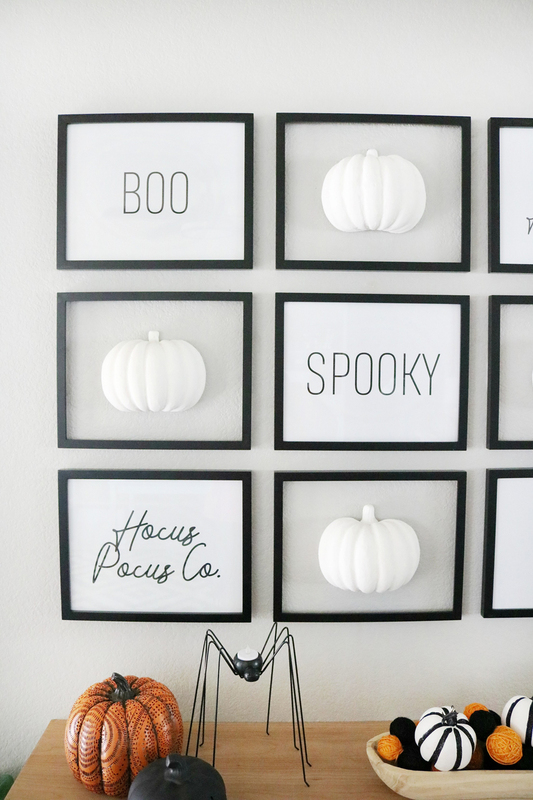 When planning my Black & White Simple Halloween Pumpkin Gallery Wall I knew I would need some cute art for the other frames. 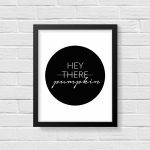 I created simple prints on my computer and had them printed to fit inside the 11 x 14 Black Floating Frames. I then hung the DIY Faux Plaster Pumpkin Decor in empty frames that I removed the glass from. 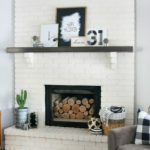 If you want to skip the frames you could fill all the frames with pumpkins or other Halloween decor. 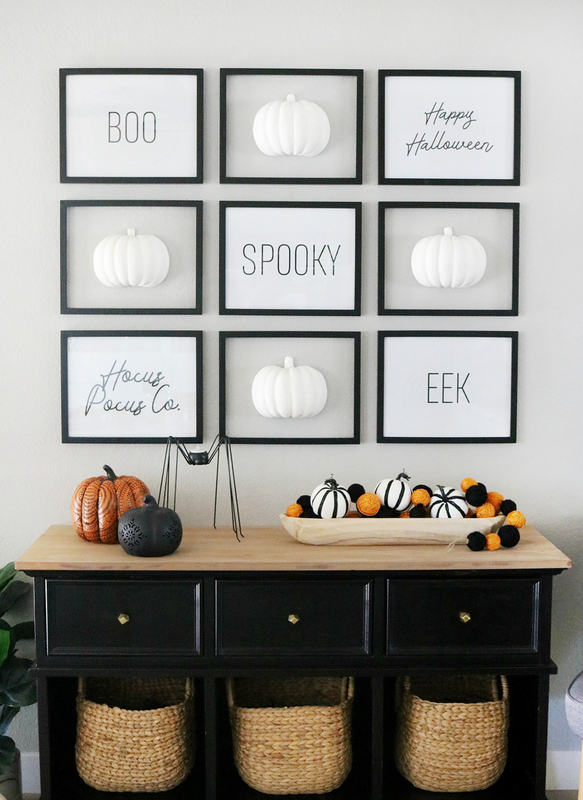 To complete my Black & White Simple Halloween Entryway Decor I found some really cute holiday decor at my local Joann store that mixed perfectly with my gallery wall. I know what you’re thinking, and yes I did add some color…just a little with some pops of orange. I really love how it looks. 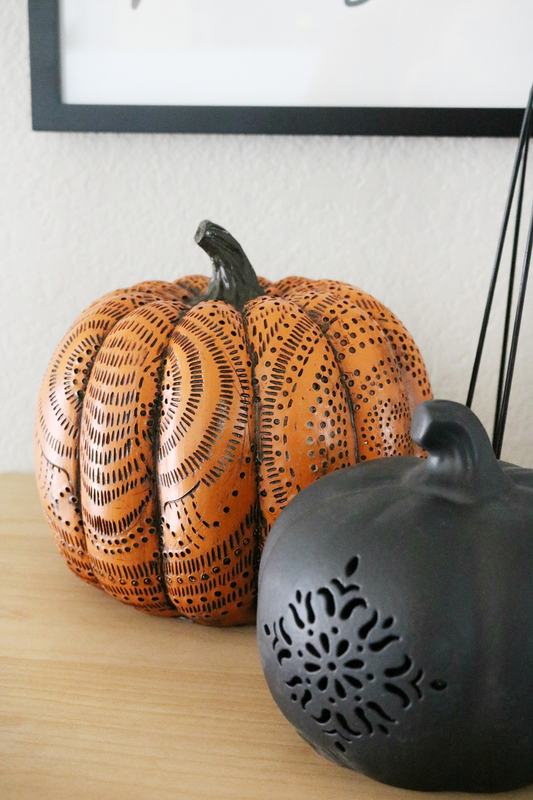 I saw this cute Maker’s Halloween Orange Patterned Pumpkin and the Maker’s Halloween LED Black Ceramic Pumpkin, they are both so pretty and I love all the detailing on both of them. I love that the black ceramic one lights up at night. I paired these pumpkins with the Maker’s Halloween Large Metal Spider Tealight Holder. Isn’t he cute?! It added just the right amount of height I needed for some visual interest on my entry table. The last addition to my table top was this pretty long wood bowl filled with another small pop of orange and some of my favorite pumpkins. 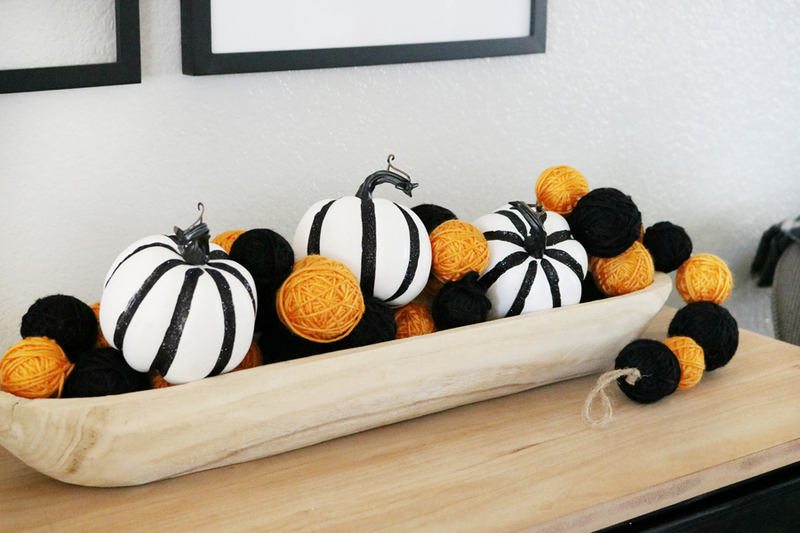 The bowl I already had on hand, and I filled it with the Maker’s Halloween Yarn Ball Orange & Black Garland. 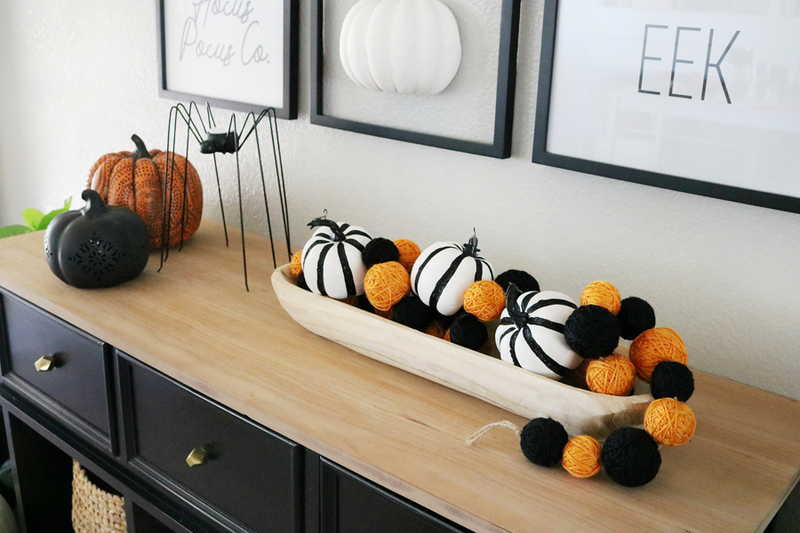 I added a few of my favorite Maker’s X-Small Black & White Strip Pumpkins, I seriously think I pick some of these up every year because they go great with everything Halloween. 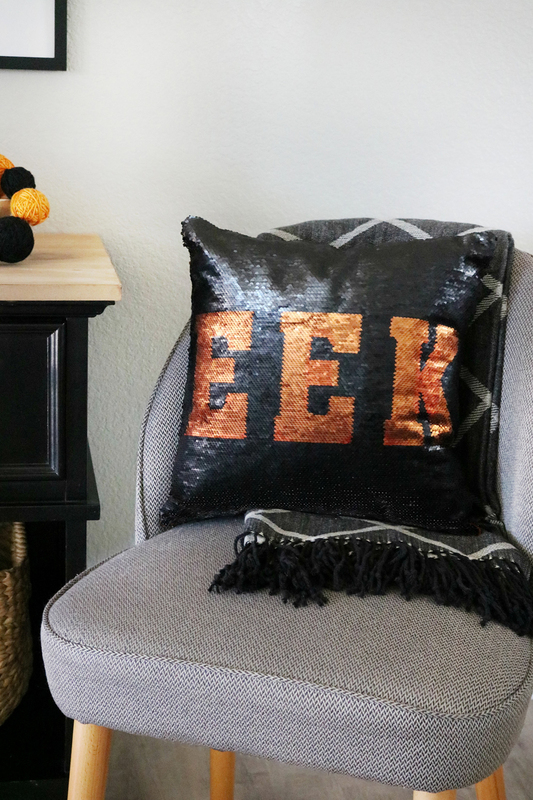 To complete the space I added this cute Maker’s Halloween Sequin Boo & Eek Pillow and a super cozy and soft Black & White Plaid Tassel Throw Blanket to my chair. My boys love this pillow, and I have to admit it’s kind of fun to play with. Running your hand over the sequins switching it back and forth between Eek and Boo. I also added a Large Black Fun-Kins Halloween Carvable Pumpkin and a Medium White Fun-Kins Halloween Carvable Pumpkin next to my entry table to balance out my decor. 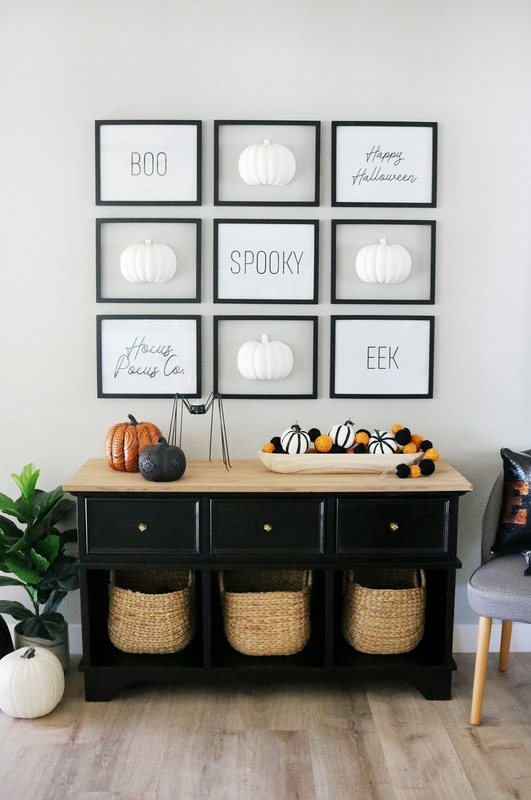 This Black & White Simple Halloween Pumpkin Gallery Wall Entryway and Decor turned out so good! 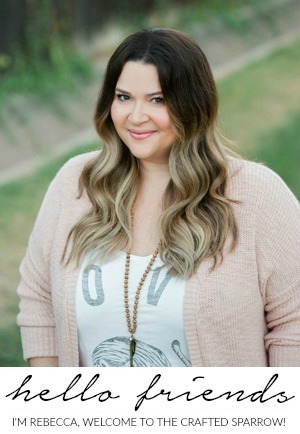 I love how it looks, and I really love the small pops of orange with the neutrals.